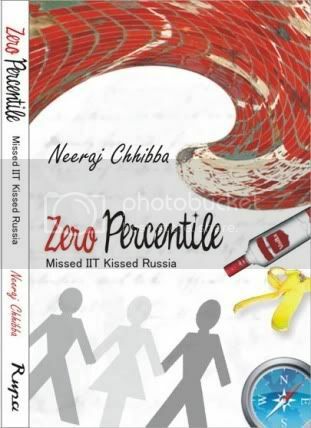 I happened to read the book Zero Percentile by Neeraj Chhiba, which is his first book as an author. The book is a part of flurry of Indian authors who have written about their experiences in Engineering, Medical, Journalism, and MBA. However, Zero Percentile belongs to the different league though belonging to the same genre. Neeraj has told the tale of a guy who was destined to get into IIT, but eventually for some unfortunate reason couldn’t make it. The protagonist, Pankaj, then proceeds to find the answer to his education in an engineering course in Russia. The distinctiveness of the book lies in the longest part which was placed in Russia. The story is divided in three parts, first being the early phases of Pankaj’s life. Followed by the second, his engineering times in Russia, and the third and the final part being his love story in the foreign land. The first part which is set up in Delhi features the initial story of the protagonist from his birth to development of a young JEE aspirant and his struggle to make it to the IIT and eventually not getting it. This part was my favorite part of the entire book, I read it like a breeze a probable reason for that might be that this one was very similar to my own experiences and I could relate to it far more than Russia or the love story in the last part. The way Neeraj, has portrayed the rise of JEE aspirant in a middle class Indian family is simply commendable and very realistic. The second part of the book is also very well done and, for the author’s credit, is very well researched for someone writing a book for the first time. The description of life and struggle in Russia is very picturesque and detailed. The way of life and the variation in lifestyles from the communism to the capitalism and its impacts are very well covered through the eyes of a foreigner student, makes for a compelling read. The final part was the one where Pankaj, finds the love of his life who is his Russian teacher and his dilemma to work it out in the last phases of his stay in Russia. The part primarily focuses on the love life and moves towards a happy ending where everyone is happy leaving a feel good feeling around. The book is a typical masala read having all the elements of a bollywood movie. I would not be too surprised if Neeraj joins the ranks of Chetan Bhagat, who pioneered the masala reads around college life in India, by selling this one as a bollywood movie. The book is fairly well paced and doesn’t become a drag while reading. The story moves quickly omitting the unnecessary details and making sure to connect the character with the reader. One drawback of the book I felt was, that the climax was wrapped up too soon. The love story, going back to India, setting everything right and a place to close story deserved more attention and detail for the story that was being told. Summary: For a first time writer, a very good attempt to a book and every bit worthy of the praise. I would recommend this to anyone willing to pick up a light read, and more to anyone who has struggled hard and would relate to the pains of going through the JEE exam. The author is also a seasoned blogger and you can read more about the author here. @Rahul: Thanks a lot 🙂 Read this book already? @Reema: It is interesting and a good read. @Ankit Singh: I loved the first part of the book for the same reason, I am sure you will relate with it too. @IndianHomeMaker: All Middle Class Indians would love to read about an IIT aspirant. Hmmm, quite a statement, I don’t know, even now? may be yes. i have ordered a couple of books from the 500 from that indivine gift voucher.. I hope to start reading… its been ages…seems books n me are not on talking terms since a long time ! if i manage to finsh the couple… this sounds interesting ! Interesting review, Prateek. Thanks. Let me check in my library. I also read this author/blogger interview on blogadda. @Solilo: He is making quite some news, has been on flipkart bestseller since past few weeks. But as u said it is a masala entertainer! @Smita: Waiting for your review. Lets see how you find it. @Monika: Sure do when you get a chance.